The present perfect (simple) ! -- for irregular verbs : .... There's no rule : YOU HAVE TO LEARN THEM ! b) The negative and interrogative forms of the simple past : are quite easy to make : You must use the auxiliary : Did/Didn't : ex : Last month, I didn't know him, but he knew me ! Did you know him ? d) The simple past is the tense of narration. ex : I saw him when I arrived. The interrogative form is obtained reversing the auxiliary and the subject, and the negative form, simply by adding not ! ex : Yes ! I have seen him but he hasn't seen me ! Have you seen him too ? ** When the moment of the action is not insisted on, or indicated, because it is the action which is important (Have you, or haven't you done the action ?). ** To express an action which started in the past and has a visible impact in the present. The present perfect simple is the tense of the result of the action. ex : Of course ! I have already read this book several times. Good luck for the exercise ! Be careful, and everything will be OK ! 'OOOOOOlie! Have you tidiedDid you tidieYou tidiedYou have tidiedI don't know up your room ?' 'Yes, Mom, I 've done it've do it've did itdid itI don't know yesterday before going to bed !' 'OLIVIA ! 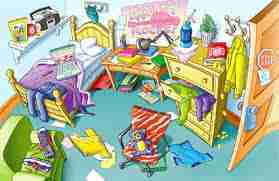 An hour ago I have said I have wantedI have said I wantedI said I wantedI don't know you to tidy up your room... In fact, you doneyou didyou has doneyou've doneI don't know nothing ! I mean : ' have you putyou did puthas you putdid you putI don't know all your games away into the right boxes tonight ? (no answer...) Olivia ! Look at your room ! It's in such a mess... You have scattered and mixedscattered and mixhave scattered and 're mixedI don't know all the pieces of your jigsaw puzzles on the floor ! And what did you dohave donedo you dodid you didI don't know with your Sylvanian families ? The hedgehogs have settledhave settle're settlewere settledI don't know in the same room as the squirrels ! Did you really putDid you put reallyHave you put reallyHave you really putI don't know the wolves in the same house as the sheep ! You didn't dowouldn't dodon't domight not docouldn't doI don't know that !' 'Yes! I wasI didI hadI haveI don't know ! and it is workedhas workedwere workingworkedI don't know ! They have become friends and have livedbecome friends and livedhave became friends and have liveI don't know in the Lego house... ' ' Oh ! Yes, the Legos too... Well, little girl, I'm sorry but I makedI'm makingI've madeI madeI don't know a decision... Either you put all your toys away OR I'll do it myself !